This is more or less how Arkansas wants to play football: smash everything in sight. Bret Bielema wants his team to be the most physical and tough team on the field every time out. Last year toward’s the end of the season, the team did it and did it extremely well. Nobody wanted to play the Hogs at the end of last year and they look to carry that same grit and toughness into 2015, but will have to do it with several new faces on defense and without one of their top weapons at running back. Jonathan Williams’ foot injury puts a huge kink in Arkansas’s offensive plans. He will miss most, if not all, of the season. That puts a bigger burden on Alex Collins’ shoulders. 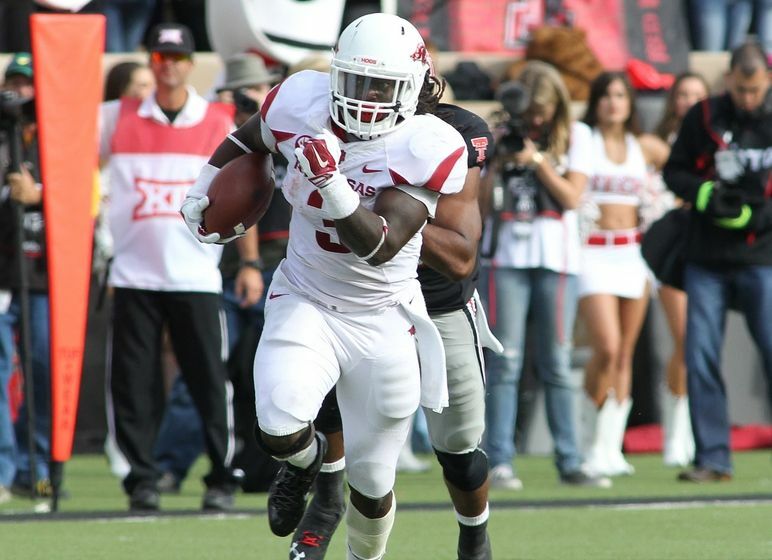 Alex Collins finished just behind Williams last season with 1,100 rushing yards and twelve touchdowns. (Williams also rushed for twelve touchdowns, but rushed for 1,190 yards). Look for sophomore Denzell Evans to potentially play more of a role in an attempt to keep Collins fresh. Collins will benefit from running behind four of the same five linemen he ran behind last season. Mitch Smothers returns at center and the massive Sebastian Tretola returns at left guard. Dan Skipper and Denver Kirkland will play the tackle spots, and as of the end of spring practice Frank Ragnow was expected to be the new face up front. Kirkland is sliding out to right tackle where Brey Cook played last season with Ragnow playing the right guard spot vacated by Kirkland. These guys are all huge with the 312-pound Ragnow being the “shrimp” of the group. Dak Prescott gets all of the attention in the West as one of the few returning quarterback starters, but Brandon Allen is actually the most experienced quarterback in the division. Allen, a third-year starter, doesn’t put up big numbers, but he did exactly what he was asked to do last season: protect the football and give your team a chance. 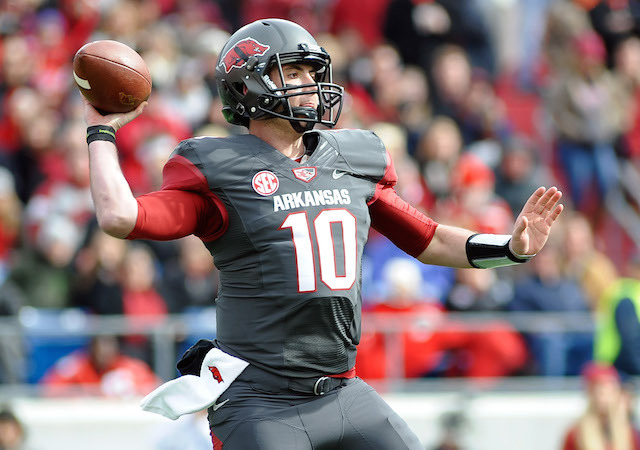 Allen threw twenty touchdown passes and five interceptions last season. Allen also gets his top two targets from last season back in Keon Hatcher and Hunter Henry. Henry and Ole Miss tight end Evan Engram are easily the best tight ends in the conference. Hatcher is not widely considered among the elite receivers, but did catch 43 passes for 588 yards last season. Sophomore Jared Cornelius is one to watch after catching 19 passes for 240 yards as a freshman. If Arkansas wants to continue having that nastiness to their defense they will need to find suitable replacements for Darius Philon and Trey Flowers. Flowers and Philon had 27 tackles for loss, 10.5 sacks and two forced fumbles last season. JaMichael Winston and Taiwan Johnson played opposite Flowers and Philon last season, and are the most likely candidates to take a step forward this season. They had 20.5 tackles apiece last season and combined for ten tackles for loss. Three of the top four tacklers in the secondary return for the Razorbacks including corners Jared Collins and D.J. Dean. Collins didn’t intercept any passes, but he did break up thirteen, and Dean hauled in two interceptions and broke up five passes. Rohan Gaines also returns at safety, and sophomore Henre’ Toliver should be the primary nickelback again this season. 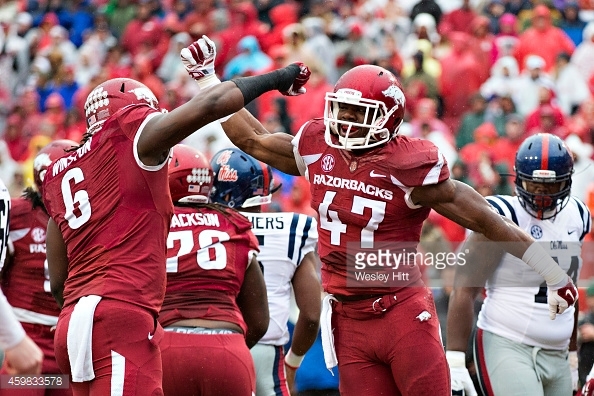 At linebacker, the Hogs will have to replace last year’s SEC tackle leader Martrell Spaight. Khalia Hackett will be tasked to step up into Spaight’s middle linebacker position. He will have both linebackers that flanked Spaight last season back to help him out in Brooks Ellis and Josh Williams. These three had better stay healthy though, because Arkansas is very thin at linebacker. There are only six total players on the roster listed at linebacker, giving them exactly two deep. There was a point in time this offseason where I genuinely considered picking Arkansas to win the West. I still think they have a legitimate chance, but upon further review I couldn’t pick them. Especially after the loss of Jonathan Williams, I’m concerned about the load that Alex Collins will have to bear for this offense this season, and even if Brandon Allen is good at protecting the football, he doesn’t stretch defenses vertically particularly well. The defense also suffered from major attrition in the front seven, so there is no guarantee that they pick up right where they left off last season. However, I do think they take major strides in the record book this season, and I think they will be a tough out for every team in the SEC. Picking their losses right now I’d say Alabama and Ole Miss on the road for sure, with the third either being Auburn or Tennessee.